I reread these words just after my grandmother's passing last month. I was having a really hard time. Of course, Hiram was being amazing and loving, but I still was grieving. I was especially sad thinking that someday my own children will not receive the beautifully wrapped gifts from Grandma Allen (she used to say, "The package is better than the present..."), wouldn't see her roses and pink and lace. Hiram would never see how much she did for everyone without a single complaint. They wouldn't experience her creativity, her compassion, and her service. As I spoke with and listened to other family members, I realized that she has always made things beautiful. She has always been compassionate. My dad spoke of how my Grandma would often say, "You got that from me" or "You didn't get that from me". The first phrase meant that she was proud of you, the second meaning the opposite. I had heard her say these often, but had given very little thought to the significance of it. Anyway, as the month has passed, I'm still mourning her. Every time I see a rose I'm reminded of her, and it's hard all over again. But I realized that I can "get" something from her -- I hope that I have inherited a sliver of her selfless service, and her creativity as well. In short, I hope I have inherited her ability to "create beauty and [be] compassionate to others". Perhaps in doing those things, I can still be close to Grandma, and emulate all of her wonderful qualities that I want my future family to experience. 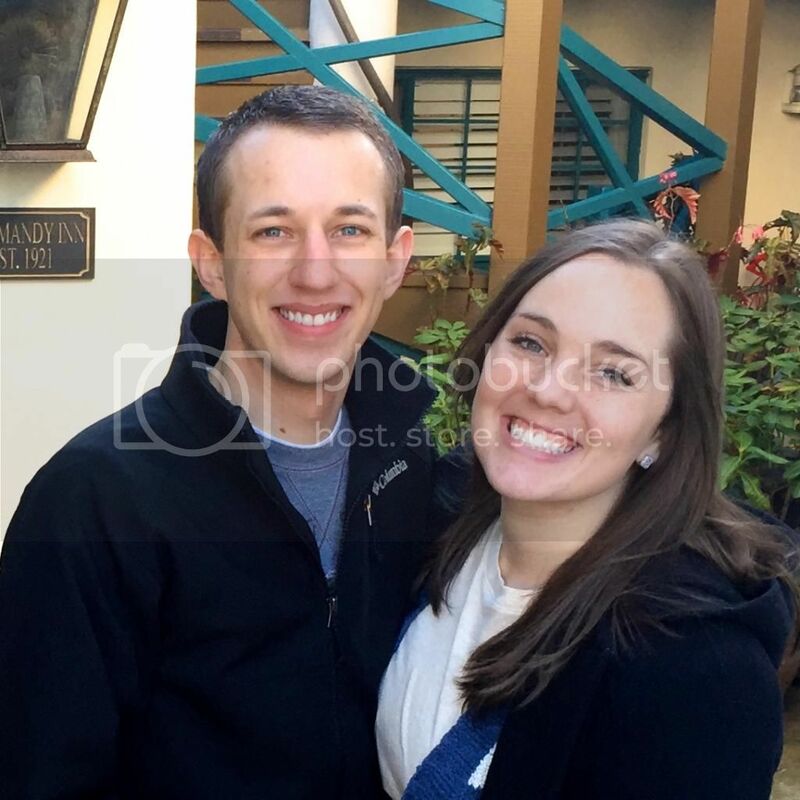 So, while I know President Uchtdorf meant many things by "create beauty", here is a bit of beauty I've been trying to create through crafts, which is something Grandma did and taught all of us grandchildren (even the boys crocheted!) to love. 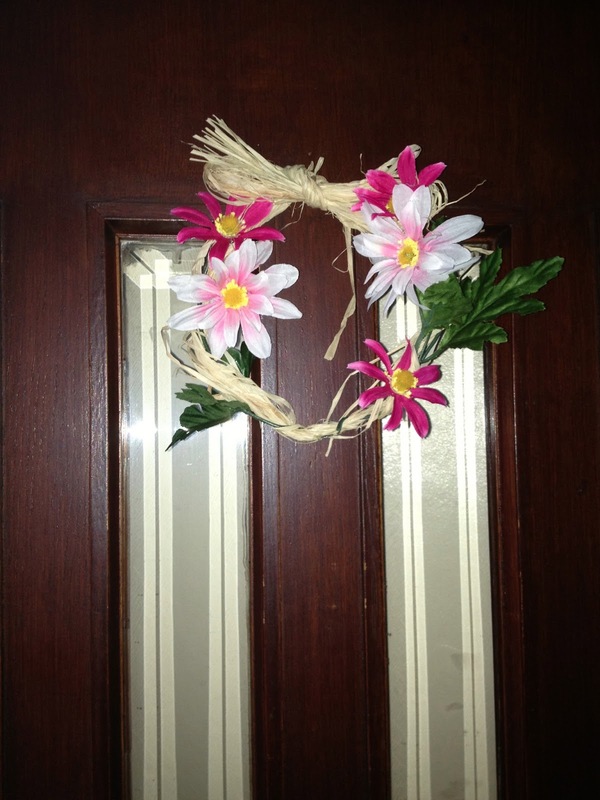 First, I made a simple spring wreath. The twine was left over from maybe wrapping Christmas Gifts. I didn't even untie it, I just crossed it across the middle and looped it back onto itself, making a smaller circle. Then I wove wire flowers through it that Grandma Allen gave me last year for my birthday. 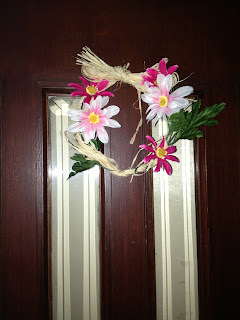 Second, I made a little rosette. The story is, I accidentally spilled some jewelry cleaning solution that's bright blue on a quilt coverlet we received as a wedding gift from my mom... and even after a few oxyclean soaks, I still couldn't get it out. I was going to use this rosette and others to cover the stain, but got too busy to make more. That will have to wait for summer! You can see the tutorial for the flat rosette I made at this blog. Disclaimer: I am NOT a seamstress. I was taught how to use a sewing machine, but the last time I sewed anything with one I was heavily on medication as I had just gotten out of surgery. Silly me. Anyway, my steps are crude, but logical. My stitches are also crude, but hold. 1. Choose how wide you want your collar to be, and draw a pattern on a piece of paper, and then cut it out. 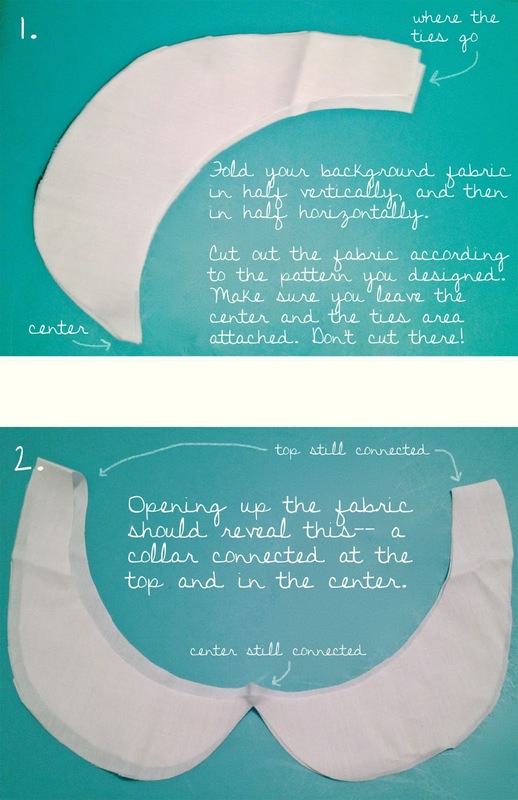 Fold your background fabric in half vertically, and then in half horizontally. 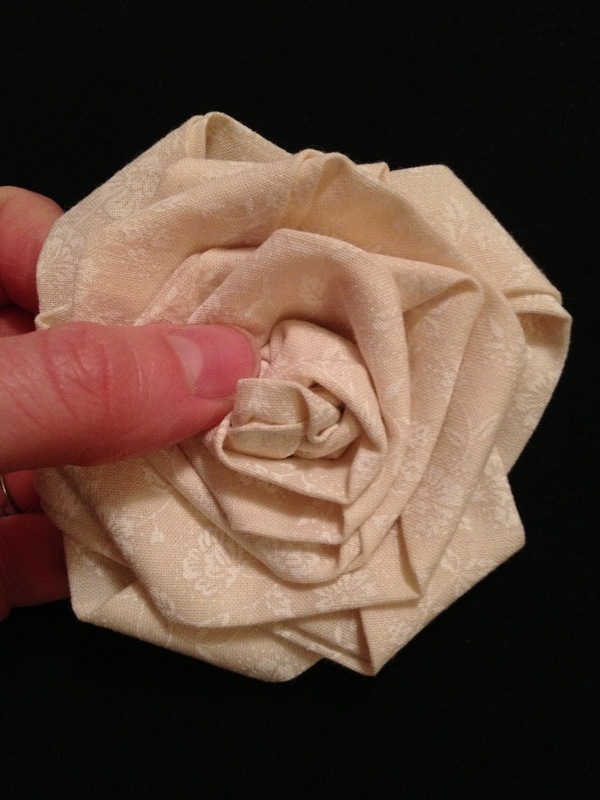 Trace your pattern onto the fabric. 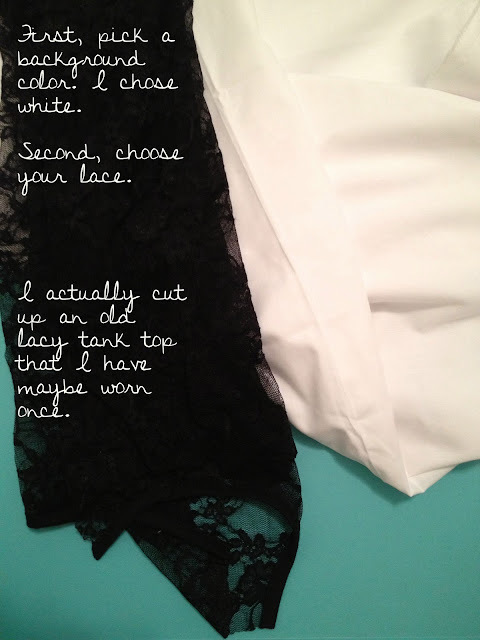 Cut out the fabric according to the pattern you designed. Make sure you leave the place where the ties go and the center un-cut. They should still be attached. 2. Open up the fabric. You should be looking at a collar with the center still connected and the two ends where the ties go still connected. 3. 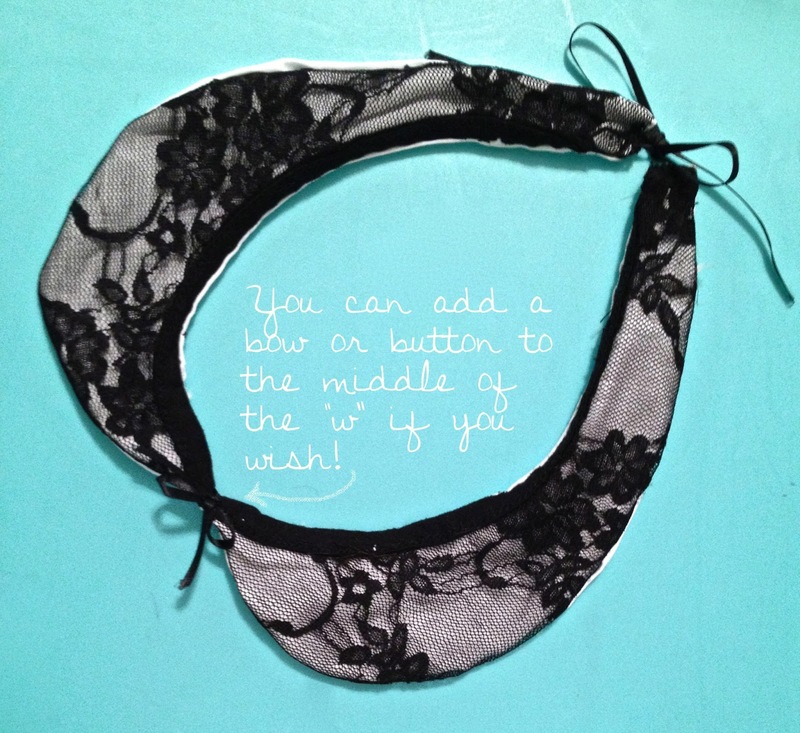 Cut out lace so that it is just slightly larger than the pattern. 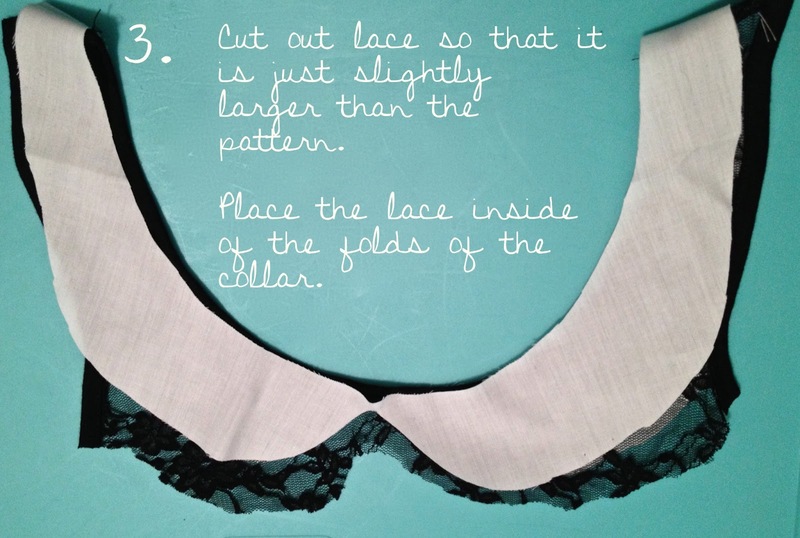 Place the lace inside of the collar that you just unfolded. 4. 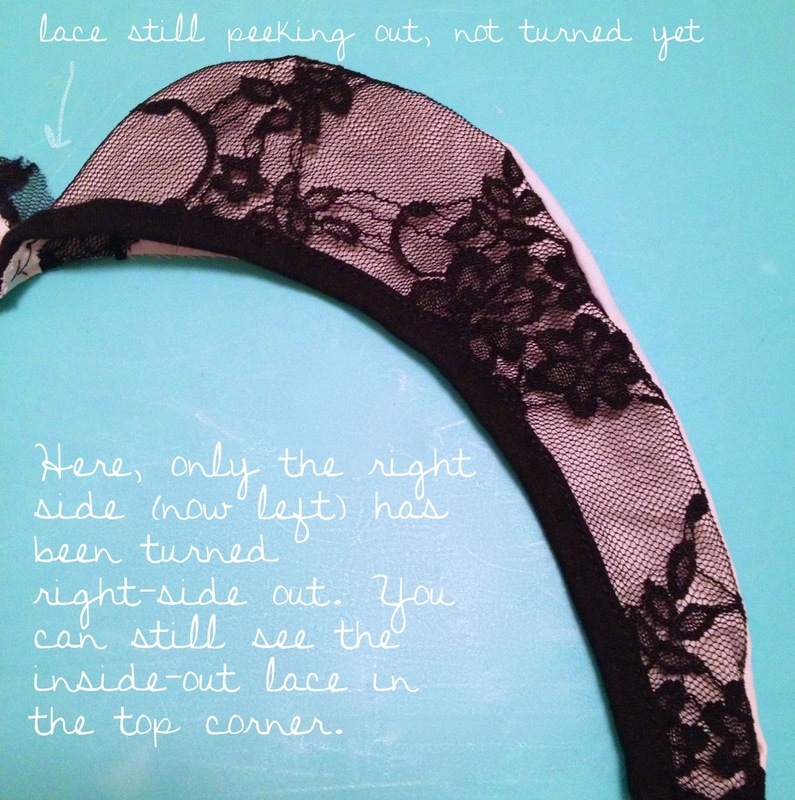 Stitch the top of the collar on the lace to ONE side of the background fabric. 5. After you've stitched the top to one side of each part of the "w", stitch both the front and the back of the collar to the lace at the bottom of the "w". You can go all the way across the collar. 6. 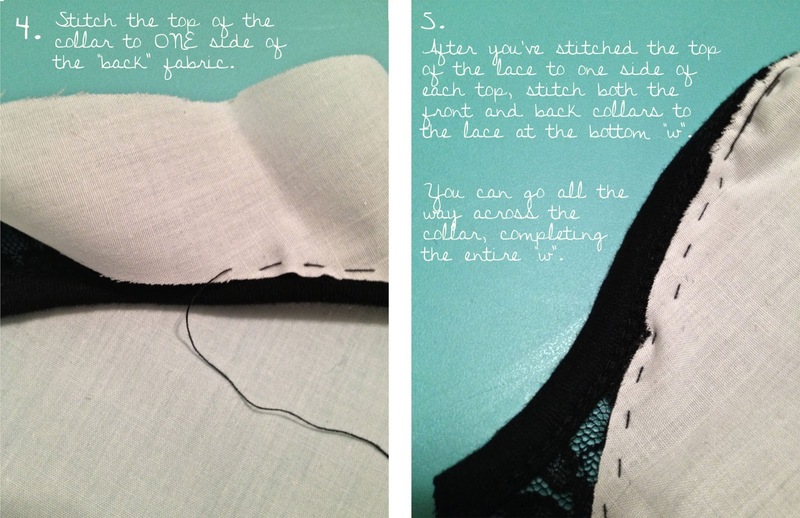 Starting up where the ties go, stitch the top of the right back collar to the lace. Stop about an inch from the center. Repeat this for the left side. What you should see is the entire collar sewn together, except for two 1-inch sections on the back side at the center. 7. Using a pencil or another thin and long item, slowly push your collar inside-out. You should slowly see the lace pushing through, and should be able to do this one side at a time, like in the picture below. 8. After you have turned both sides of the collar right-side out, stitch up the remaining inch or so on each side with thread the color of your background, so that it doesn't show. 9. Stitch two equally-lengthed ribbons onto ends of your collar. You can choose thick ribbon, and any color length. I wanted mine to be less noticeable, so I used about 5 inches of thin black ribbon. 10. 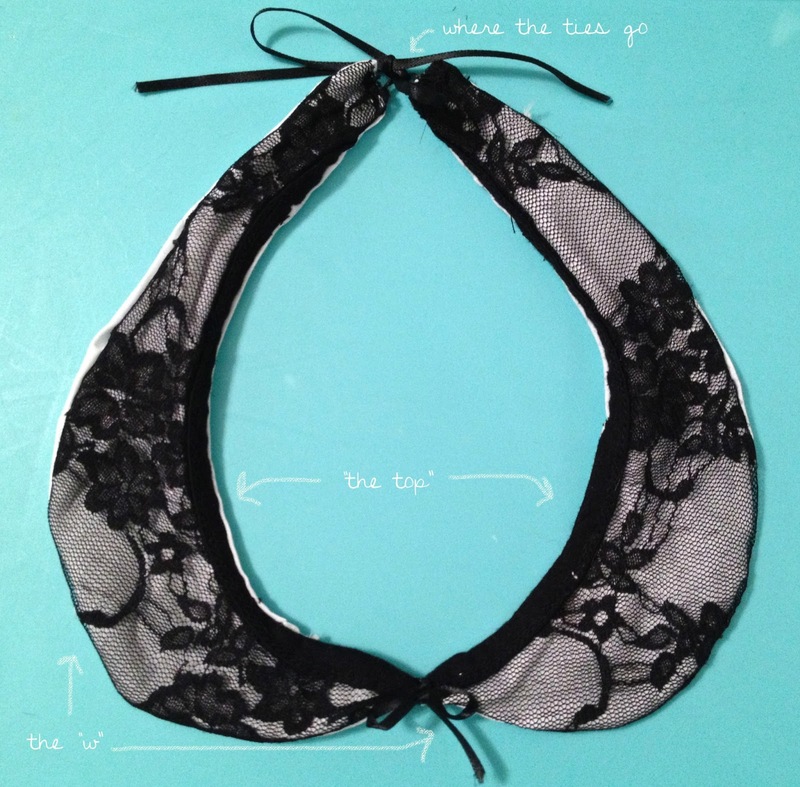 Embellish if you desire (I tied a bow), and wear! Voila! A Peter Pan Collar Necklace in ten steps! Of course, you can be more precise and sew a little more cleanly, but I'm happy with it! The first time I wore it, I received multiple compliments on my "cute shirt"! Don't judge the white peeking out... I hand-stitched this.